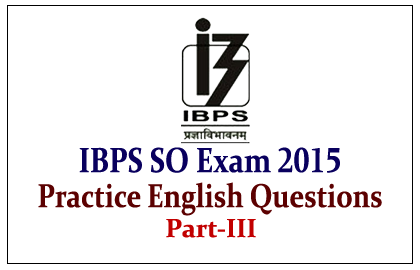 List of Practice English Questions for the upcoming IBPS Specialist Officer Exam 2015 were given below. Candidates those who are preparing for those exams can use these questions to score more marks. WHO estimates that, within next few years, non-communicable diseases will become the principal global(1) of morbidity and mortality. The role of diet in the diagnosis of most non- communicable diseases is well(2). The shift towards highly refined foods and towards meat and dairy products containing high levels of saturated fats, now increasingly(3) In middle-income and lower-income countries, have , together with reduced energy(4) contributed to rises in the(5) of obesity and non-communicable diseases. Because of the global extent of the epidemic, the advantages of promoting healthy diets and preventing over nutrition should be explored. The prohibitive costs of treating the consequences of over nutrition require that increased attention be given to preventive measures. Parallels exist between these requirements and the initiatives taken to control tobacco consumption, from which important(6) can be learnt, especially with respect to the use of international legal instruments. However, because some of the largest multinational companies are heavily involved in the creation and marketing. Of unhealthy foods, the control of these activities presents a(7) challenge. There is a growing(8) that prevention demands public health actions at both the national and global levels, ranging from more health education to improved food labeling and controls on the marketing of certain foods and soft drinks. This will require innovative and committed(9)by all(10).